In 1860s Cambridgeshire, England, a girl named Elizabeth Bangle gave her cousin a beautiful tapestry. In 2017 Australia, the long-lost descendants of these two cousins reconnected — and the tapestry found its new, rightful home — thanks to some determined family history research and a call-out in Inside History. Christine Marshall Cox reports. Imagine my surprise before Christmas last year when I noticed a familiar surname, Bangle, while browsing through a back issue of Inside History at the library. I had not seen the surname in print before yet it was a name well known to me – and coincidentally it was the first time I had read Inside History. Sisters Pam and Wendy Valentine authored The Story of John HOLMES and Sarah BANGLE, Cambridge and were selling copies, providing an email contact in Inside History (issue 34, May-June 2016). My knowledge of the name Bangle came through stories my English mother told me of her family’s lives in Cambridgeshire. I emailed Pam and Wendy enquiring if their Sarah Bangle (1829–1897) was in any way related to Elizabeth Bangle of Hauxton, Cambridge (1845­–1935), of whom my mother had spoken. Pam replied that she had researched her papers and had established a link showing they were second cousins once removed. Amazing! 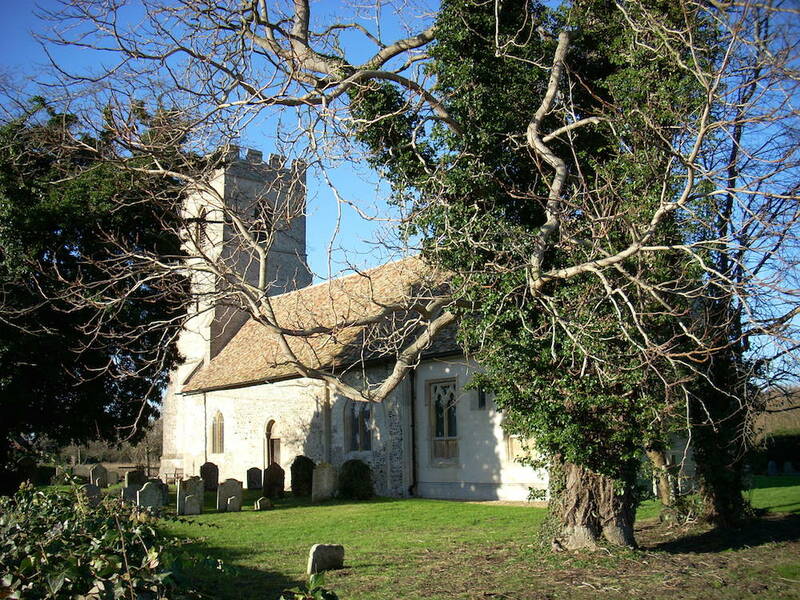 Church of St Edmund in Hauxton, Cambridgeshire. Courtesy Wikimedia and Cruccone. In 1857 my maternal great-grandmother Emma Whybrow of Hauxton married Arthur Cambridge of Barrington and set up a bakery around the corner from Emma’s family who were in High Street Hauxton. Four years later Emma was given a tapestry which depicts two young women talking with an older woman along a country path, worked by her cousin ‘Elizabeth Bangle aged sixteen, 1861’. Elizabeth Bangle, it was said, was gentry, which my great-grandmother was not and accordingly the tapestry was highly regarded by the family. My mother Patricia Marshall subsequently inherited the tapestry and had it shipped to her from Foxton to Canberra, Australia. In turn I inherited the tapestry and hung it in my study at home in Canberra. No wonder the surname Bangle rang a bell. Because of my interest in family history and wish to preserve the tapestry for future generations, I was conscious that its relevance in our family would soon be lost. After talking it through with my daughter Roslyn Cambridge Lemon, we decided to return the tapestry to Elizabeth Bangle’s descendants in Australia. Needless to say, Pam and Wendy were delighted! On 29 January 2017 Pam was presented with the conservation framed tapestry (in good condition and colour) at my home in Canberra. In return Pam presented me with an annotated copy of The Story of John HOLMES and Sarah BANGLE, Cambridge. Sincerely, Pam & Wendy Valentine 29 Jan 2017. 29 January 2017. Image courtesy Christine Marshall Cox, taken by Glen op den Brouw. The perfect home for the 1861 Elizabeth Bangle tapestry had been found — all because of Inside History, coincidence and accurate research. The tapestry now appropriately hangs in Pam’s home together with an embroidered family tree she created giving the names of her nine grandchildren: ‘Nana Pam’s Favourite Tree’. Incidentally, when I was a little girl my grandmother, Florence Cleal of Foxton, sent me a blue enamelled silver bangle and later as a teenager, a gold plated bangle – presumably in memory of the Bangle family connection which in turn would have reminded my mother of those family stories related to her over the years. My daughter Roz now has both bangles in her possession, perhaps waiting for her own granddaughters.